OUR NEWEST CATALOG VOL 18! Has our latest sets and even some deals! There are two choices of MONEY SAVING options in our Catalog! Choose to Save Up To $20 on a mail-in orders using the attached order form, or choose to Take 8% OFF online orders when you use the online promotion coupon code listed in the catalog! Please Note: We accept authorized Purchase Orders from schools and facilities in the USA. Faxed to us at: 1-904-216-5478. We will quickly provide our W9 form on request. Please use pricing from our catalog or the non-sale regular price of items on our website for all POs. Shipping & Handling of PO's is 10% of the subtotal for PO orders, with a minimum of $5.00. If you do not receive your order with in 7 days of sending a PO, PLEASE email to confirm we received the PO! We have a fast order turn-around so you should get your order very soon after placement. WANT TO BE MAILED A CATALOG? WANT ACCESS TO DISCOUNT CODES, SALES, & SPECIALS? Sign up your email address! We will send you our INSIDERS eNEWSLETTER! Include your ADDRESS and we will Mail you a catalog when issued! 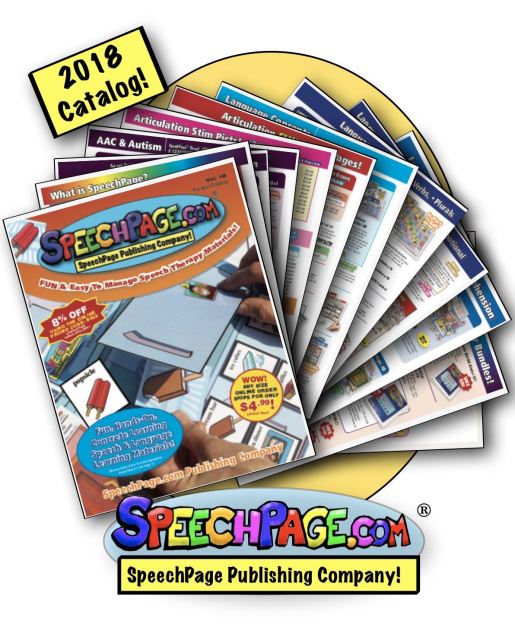 Now You Can LIKE SpeechPage ON FACEBOOK! Keep up with all of our Latest Offerings and Free Downloads!